Raised in Australia's multicultural tropical city of Darwin, Kath Inglis moved south to Adelaide to study contemporary jewellery. 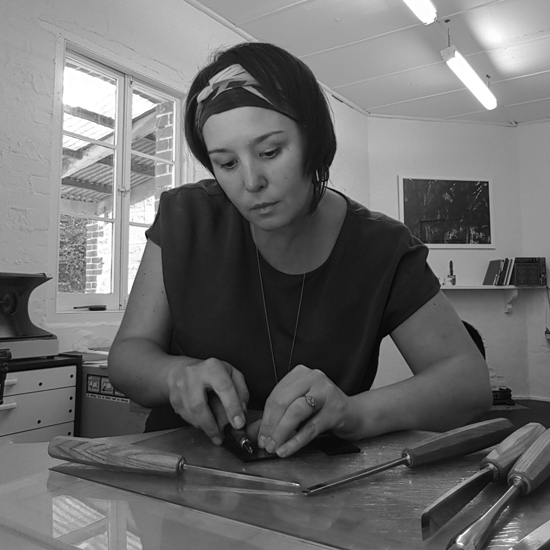 After graduating from the South Australian School of Art in 2000, Kath continued to develop her practice by working from a number of studios, including the renowned Gray Street Workshop, JamFactory's Metal Design Studio and soda and rhyme. Kath now lives in the beautiful Adelaide Hills with a work bench located in a nineteenth century stable. My passion for Polyvinyl Chloride (PVC) started in 2001. It’s a prosaic material in its natural state, but loaded with potentials. Simple hand worked processes - applying colour, removing pieces from the surface with carving tools or adding heat fused layers, elevates this material into the precious. Observations, concerns and issues inspire a self portrait of wearable pieces. This conceptual approach to making continually progresses my work. Here is a short film by Angus Lee Forbes for the Australian Design Centre's exhibition 'Obsessed - Compelled to make' which gives some insight to my contemporary craft practice.